Unfortunately, during the production of the KEF IQ and Uni-Q series an inferior rubber surround which decays relatively quickly was mounted. 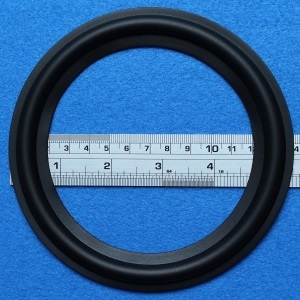 We offer a solution for this: a high-quality rubber surround, in accordance with the original specifications, which can replace the broken surround. Suitable for all KEF IQ and Uni-Q woofers with a 116 mm cone size. 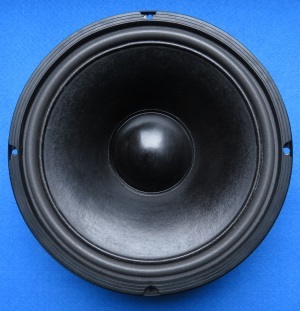 From now on we have a new foam surround in our product range for the REL Quake subwoofer (Westra PW-250-2158). This surround was specially designed to be mounted behind the cone of the woofer, with a specially developed inner glue edge. We have also made a manual for the repair. These will become available in the shop in the coming weeks. If you are interested before they are published you can contact us. Today we nearly ran out of fine black speaker cloth.... We are really sorry. We ordered more, and we expect to able to deliver in 2-3 weeks. We would like to inform all customers in the USA it seems US customs do not release any items anymore due to the shutdown. All parcels we traced over the last days are stuck at customs clearance. Please note the shutdown might delay the delivery of your items as well. Lately we get a lot of questions about parts to repair or replace the tweeter in the B&W DM60x S2 series. Unfortunately, these parts are no longer available. The tweeter of the B&W DM60x S3 series is unfortunately not interchangeable with the S2 series because this tweeter is mounted in the cabinet in a different way. 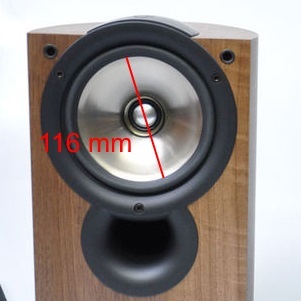 If you have a defective DM60x S2 tweeter, it is best to look for a tweeter at the second-hand market. If you find one here, we strongly advise you to replace the ferrofluid in the tweeter to ensure a longer lifespan. More information about this can be found elsewhere on this website. Recently we bought a lot of Dali parts from a Dutch Dali dealer who went out of business. Many of the parts are no longer available elsewhere and are no longer produced / delivered by Dali. The parts incluse original Dali woofers, midranges, tweeters, but also other parts like terminals, spikes, grilles etc. All Dali parts will gradually become available on this website, but a lot of them can already been seen in an overview here. All parts are new and original but the numbers are limited, of most parts there is only one piece available. Because these parts can no longer be ordered from Dali, we will only send these parts with a track and trace number. The nozzle is 1 mm in diameter and the nozzle is blunt. More info and examples of applications here. We expect the items to arrive next Thurday and we will gradually put them on offer after inspecting and takng some pictures. Some of these will be available once, from other we will have more than one piece available. If you need more info, or you want to reserve an item please contact us through the main menu. After losing several shipments to Brazil and Mexico (despite shipping with full tracking services) we have decided to suspend shipping services to these countries until further notice. We are sorry for any inconvenience caused. Over the last few months we have lost quite a few shipments (in?) to Canada. As a result starting today we will only ship to Canada with a registered service. We are sorry for any inconvenience caused. To prevent people from being flooded by unwanted emails, more and more people are installing a SPAM filter. Unfortunately, these filters do not always work correctly100%. It is possible that the filter considers a 'real' e-mail from us to be SPAM - mostly because the filter thinks that our e-mail is about an 'offer' instead of a purchase. As a result, customers sometimes do not seem to receive our emails because the filter moves the mail to the 'SPAM' or 'Unwanted email' folder. We advise you to scan this folder every now and then for real e-mails. Most filters are self-learning systems and when you mark an email marked as 'SPAM' as 'real email' the filter will adjust the algorithm over time. This website is now fully secured with SSL encryption. Your surfing behavior can therefore not be viewed by third parties. However, third parties can still read your metadata - they can see which site you are on. However, the content is sent encrypted. The gray speaker cloth is now (limitedly) available again. Due to the unknown cause, the website was not available in English from February 20th until today. This problem has now been solved. Sorry for the inconvenience. 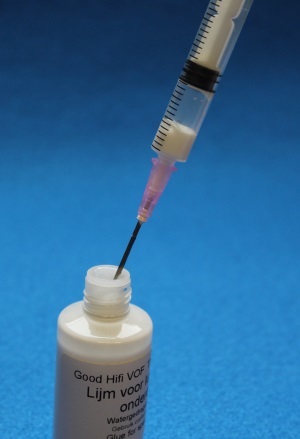 The nozzle is less than 1 mm in diameter and the nozzle is blunt - the applicator can contain a maximum of 3 cc of glue. More info and examples on how to use it here. As of 1 January, Harman has (drastically) increased the prices of a large number of spare parts, sometimes even by more than 100% compared to the price we paid in 2017. If we no longer have stock and have to replenish our stock, we will unfortunately have to charge these new prices to our customers. Unfortunately, for a few articles that is with immediate effect. Because the costs that are charged to us for the shipment of goods will increase as of 1 January, the costs that we pass on to our customers will also increase as of that date. We will calculate the new (higher) costs for all sales from 1 January 2018. Not the dispatch date but the purchase date thus determines which shipping costs will be charged. Because our glue is a water-based glue, this glue runs the risk of freezing if it is stored in temperatures under zero degrees for too long. To prevent this, we now also offer our 50 ml glue in an insulating packaging. 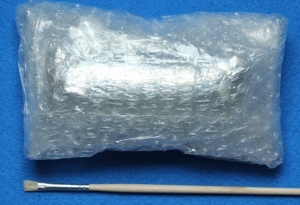 The glue is wrapped in aluminum foil, and then in several layers of bubble plastic. The result is unfortunately that it is too big to be sent as a letter, it has to be sent as a parcel. You can find the new glue here. B&W has informed us that the support for the B&W DM60x S3 series has ended. This means that the current (small) stock of spare items will no longer be supplemented by B&W with new production and articles will eventually no longer be available. If you are in possession of an S3 loudspeaker, it may be useful to purchase spare parts as long as they are still available. Due to a failing Wi-Fi connection our website has been unusable last Saturday. The Wi-Fi connection failed during an update of the website. By now (04.27 AM GMT + 1) the problem has been resolved. We are sorry for any inconvenience caused. 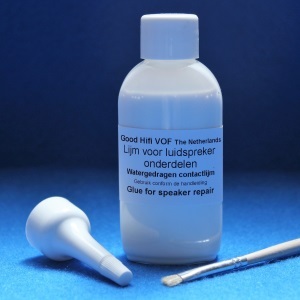 By adding the domain http://www.speakerrepair.shop to our webshop, our site was temporarily unusable and unavailable due to an mistake made by our hoster. This problem has now been solved (14.03 Dutch time). 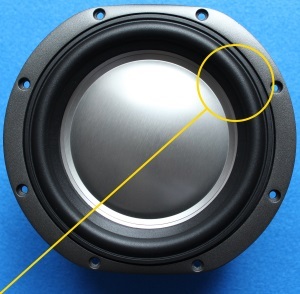 When you remove a speaker unit from the loudspeaker box, you usually will find a foam ring on the back of it, ensuring that the case is closed off airtight. Unfortunately, this ring also passes over time. 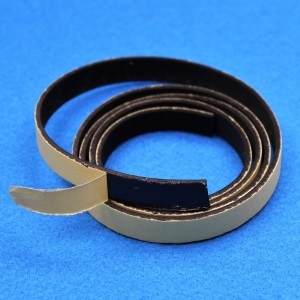 We now offer this 'Foam band', which lets you seal your speakers. You simply apply it with the sticking side, you can it as desired to get a thinner one, for instance for midranges. A manual for replacing the diaphragm. We advise all owners of the B&W CDM1 and similar tweeters (CDM1SE, CDM7, CDM7SE, CDMCSE, P4, P5 & CC6) to check the tweeter for the quality of the ferrofluid. This will prevent damage in the long term. New glue (50cc) available from today. The bottles for the 50cc glue have arrived, the item is available from now. Due to the delayed delivery of the new glue bottles, we can not deliver it in large quantities yet. We expect the new glue bottles to be delivered on Wednesday next week. Because of this we have temporarily removed this glue from the assortment. Sorry for the inconvenience. 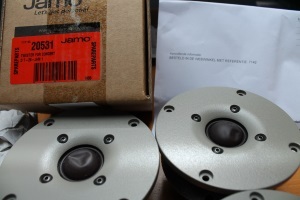 Jamo has contacted us about the Seas (Jamo code: 20531) tweeters used in the Concert series. We have told them we're interested, but unfortunately only one tweeter reached us undamaged. All the athers had dented domes. Once we solved this matter with Jamo the tweeter(s) might become available in our shop. 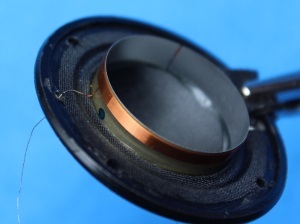 In the instructions section, we have added a manual for replacing a diaphragm for the B&W N801S (TS26 80) tweeter. This tweeter is no longer available and one by one the diaphragms start to break down. Using this manual and some spare parts, you can give your N801S tweeter a second life. 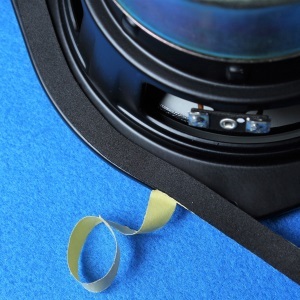 Available, starting now, special rubber surrounds to repair the woofers in the DM603 S3. The surround is available in black only, but fits both the black and the grey woofers. Since the woofer itself is no longer available fro B&W and B&W won't start the production again this is your chance to safe your speakers. 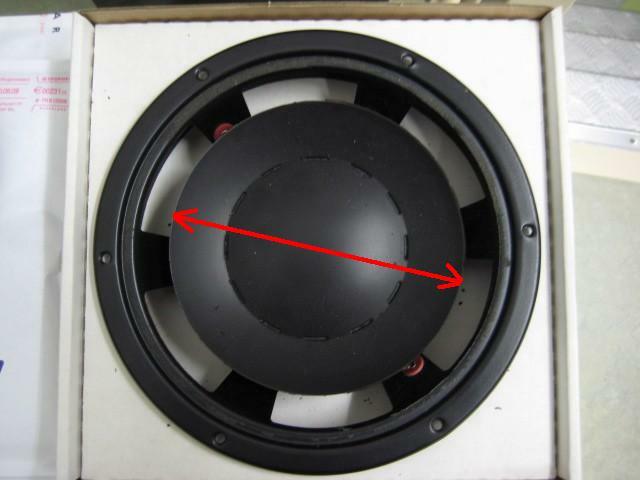 Replace a rubber surround on a B&W woofer? Finally.... A 'how to' on this subject. You can find a photo report here (or look in the 'instructions' menu). A description will be added to the pictures soon. Due to Portuguese Post performing really bad over the last few months we have decided all shipments to Portugal have to be shipped with track and trace and insurance. We stop offering a regular service due to a load of complaints we have received lately. We are sorry for any inconvenience caused by this. The new foam surround is available now. Last week we were confronted with a client who had found a coupon on the Internet. We wish to emphasize here that we never publish coupons on the Internet, and never have used or intend to use generic coupons. Every website claiming to have a discount code for our shop keeps you fool. These websites just want to attract attract 'traffic' and generate a revenue from advertisements showed to the visitors. Don't let them fool you! 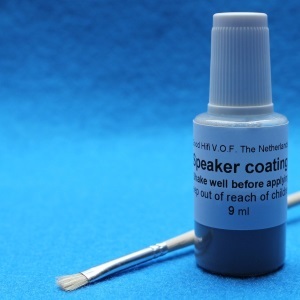 The coating is also available without the large brush. 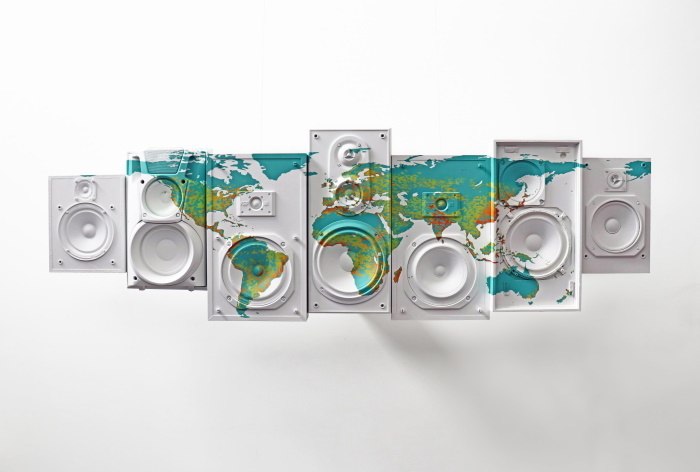 The lot JBL- and infinity spare parts we have taken over is now available in this shop. A small number of items is not online yet because we can not confirm yet for which series these are suitable. Another small number has already been sold. You will find many articles no longer available elsewhere. Some items we have more than one copy in stock, you can identify these items by the number in the articlecode. If you want to know how many we have in stock, please contact us. We offer only one copy online at a time because Google regards offering identical copies as "keyword spamming" and the items will subsequently not be indexed (and thus can not be found via Google search). All items without a number in the article code are single unique articles. For all parts: Available while stock lasts. Due to popular demand available soon: a coating that can be applied to paper cones to increase stiffness. We expect to be able to provide the coating in the second week of November. The paper cone, a layer of coating has been applied. The paper cone, after applying two layers of coating. A small change in color is noticed but the cone has gained stiffness. A third layer can be applied. During an update performed on Oct. 15th both the top menu and the 'product menu' were not visible for about twelve hours. The problem has been resolved now. Due to wrong (disc-quota) settings of our internet server a software-update failed last night - because of this no orders were possible from 03.00 AM onward. By now the problem has been solved. Yesterday, during a software update, an error occurred. As a consequence no delivery method could be selected - making ordering impossible. The error has been resolved now. Due to an incorrect setting on our server yesterday, you may have seen a message while in the ordering process during a short period about our security (SSL) certificate - the name of the certificate and the name of the server temporarily did not match. This problem has been resolved, you can order again over a secure connection. Due to popular demand, we have created a manual for replacing speaker your cloth. You can find it here or look under 'instructions' in the top menu. The woofer used in the Infinity Overture series (part number 333773-001) has long been unavailable from Infinity. Due to sufficient demand from the market Infinity has decided to produce a very limited number of woofers as a service to the owners of the Overture series. Infinity has promised us a total of twenty woofers - once sold for this type woofer those woofer will no longer be availabe. 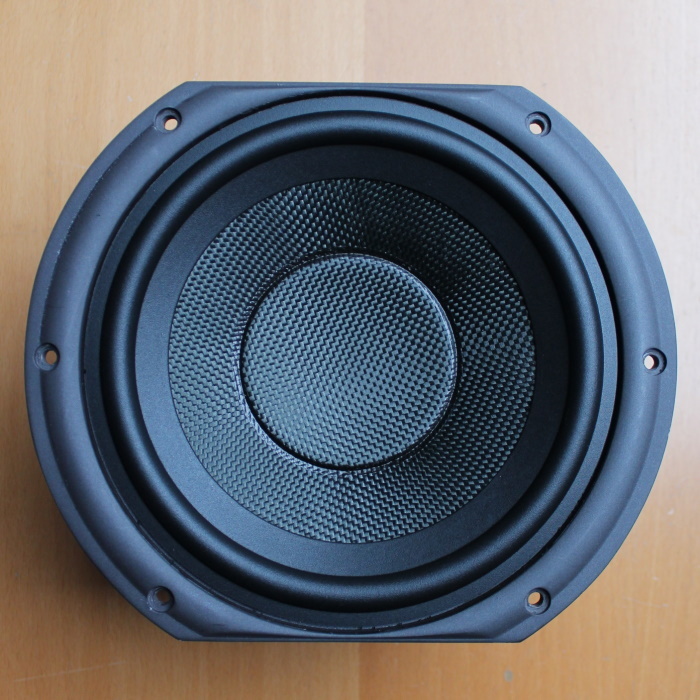 We expect to receive the woofers mid-June, the price will be approximately EUR 60,- per unit (excluding VAT). To produce your own (flat) foam surround. 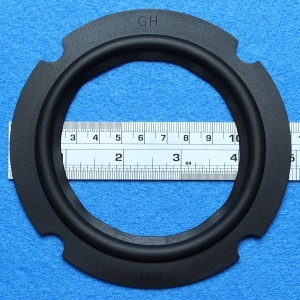 The diameter of this article is 200 mm. The thickness is 0,6 mm. Available, starting now, special foam surrounds to repair the small woofers in the JBL Go + Play. New: your orders will be processed using HTTPS (encryption) from now on. Starting now all orders will be processed using the HTTPS protocol. This means the connection between your computer and our server is encrypted and third parties can not see your personal data. Do you know that your B&W tweeter may simply be repaired? 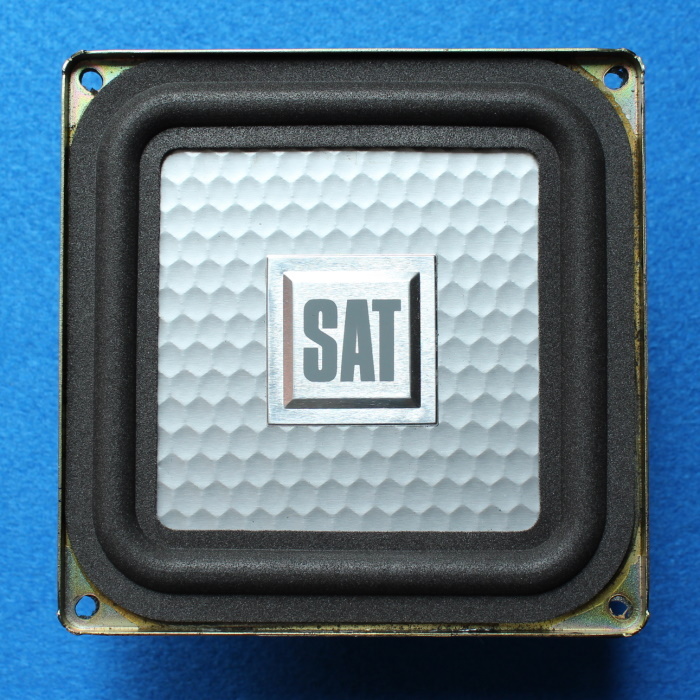 Some tweeters from B&W are no longer available, for instance tweeters from expensive series like CDM 1, CDM 1SE, CDM 7, CDM 7SE, Reference P4, Reference P5 etcetera. These tweeters all stop working properly over time - but they are usually not really broken! Although the tweeters don't play well, or maybe don't even produce sound, they are usually not fysically broken. The problem usually is the liquid used between the voice coil and magnet hardened. This fluid is called 'ferrofluid'. If you replace this fluid you can make your tweeters sound like new for less then 20 EURO. Know more? You can find the full story here. The part that will enable you to repair your tweeters can be found here. Every now and then we see a special unit, like this one from VIFA. 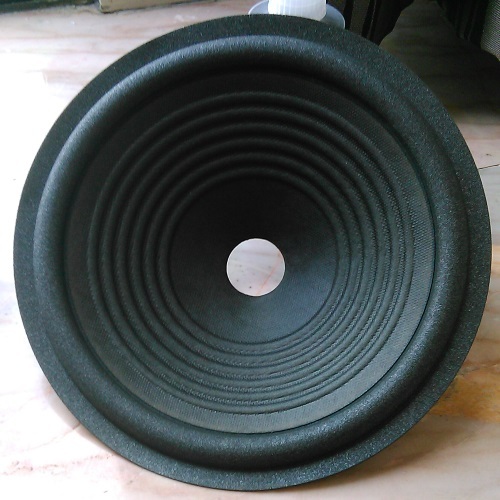 A 4 inch speakercone fitted with a wide rolled foam surround to allow maximal excursion. We have produced this foam surround, and it's available now. The brand Piega used many of these units in their speakers, so if you own a Piega you might be looking for this one. Some of those we still have in stock. 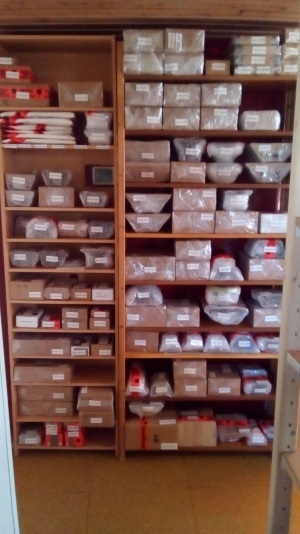 Whilse stock lasts, we can provide the parts. After that we're sorry, but we can't. Please note that if you have another tweeter than the 90-6682 and you replace it with the 902-6682 Infinity advises to replace both the tweeters. The tweeter can be ordered and now will be delivered from July 7th. The software our webshop uses suffered from one or more corrupt files making it inoperable. This problem has been resolved too. Everything is back online. We're sorry for any onconvience caused.